According to Russian experts, the recent dramatic increase in the project’s cost could have had a hand in the Kremlin’s decision to abandon the pipeline that would have sent gas to Europe via the Black Sea. Russia has abandoned its project to build the controversial South Stream gas pipeline gas pipeline linking Russia and Central Europe via the Black Sea, citing Bulgaria’s refusal to allow construction on its territory as a key factor. Russian President Vladimir Putin announced the decision during a one-day visit to Turkey on Dec. 1, the Kommersant daily reports. “We cannot start construction in the sea until we get permission from Bulgaria. And it would be absurd to begin construction in the sea, approach the Bulgarian coast, and stop there,” Putin said at a press conference. He added that Russian energy resources will be redirected to other markets by promoting and accelerating the implementation of liquefied natural gas projects. According to Putin’s estimates, Bulgaria will miss out on at least 400 million euros ($500 million) a year in transit fees because of the decision to scrap the project. However, Russian gas giant Gazprom will suffer even more – the company has invested $4.66 billion in the project in the last three years. “The suspension of the project comes as no surprise given the fact that Bulgaria has long been talking about a ban on laying pipes through its territory. We were completely unable to get our Bulgarian partners to budge,” said Ivan Kapitonov, an associate professor at the Russian Presidential Academy of the National Economy and Public Administration. In August 2014, the Bulgarian Ministry of Economy and Energy suspended the implementation of the project because it violated the European Union’s Third Energy Package. According to those rules, owners of gas pipelines in the EU cannot simultaneously be gas producers. Furthermore, the project became dramatically more expensive in October 2014, which Kapitonov said must have informed Russia’s decision to drop South Stream. The cost of South Stream’s offshore branch ballooned from 10 billion to 14 billion euros, while the onshore portion through Europe rose from 6.6 billion to 9.5 billion euros. Altogether, the project cost ended up equaling Gazprom’s entire 2013 EBITDA - $55 billion. After Putin announced the decision to freeze South Stream, Gazprom shares jumped by 1.1 percent. “Investors have a positive view of the decision the concern made yesterday to not continue the South Stream project,” Director of the Analytics Department at Alfa-Forex Andrei Dirgin said. Later, Gazprom chief Alexei Miller said that the gas giant will channel the gas pipeline away from Bulgaria to Turkey. According to him, the pipeline will carry 63 billion cubic meters of gas a year, 14 billion of which are intended for Turkey itself, and the rest of which will go to the Turkish-Greek border, with the EU as the final destination. “In this case, Russia will get the same planned effect [as from the South Stream pipeline]: diversified supplies and a way around unreliable transit countries,” said Ivan Kapitonov. He added that European countries may be surprised by the choice of a route through Turkey, since the EU did not anticipate any trade-offs in the project, especially if they involved laying pipes through a country with non-bloc status. As it stands, Russia is depending on Turkey as a transit country, but that is a necessary compromise, Kapitonov said. 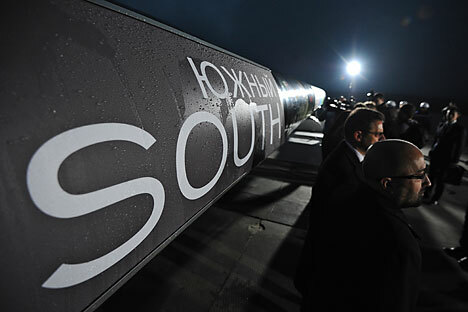 Dmitry Baranov, a leading expert at investment holding company Finam Management, said South Stream could be revived in its original form if the EU were to alter its position. “Russia will strictly adhere to the existing contracts for gas supplies to the EU,” said Baranov. In his opinion, Russia is not abandoning its pursuit of diversified gas supplies and is willing to deliver fuel to virtually any nation, since it has sufficient reserves to do so. “The eastern and western gas supply routes will be retained, and in light of the fact that India is interested in Russian gas, a southern route may also materialize in the coming years,” Baranov said. According to European Commissioner for Energy Union Maroš Šefčovič, the EU has still not canceled a meeting among the South Stream participants scheduled for Dec. 9, despite Russia’s announcement that it is dropping the project.